Every human being should have access to health care when and where they need it. In the wake of our victories defeating a series of disastrous Republican health care bills it is clear that now, more than ever, we need to protect ourselves, our friends, our family, our co-workers, our neighbors, and our communities from interests trying to further privatize and profit off our broken health care system. We must win universal, publicly and equitably financed health care as a human right here in Vermont and across the country. 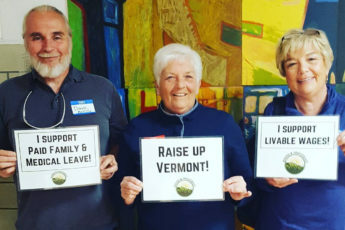 Sign up today to be a Health Care Justice Voter and show Governor Phil Scott and all our elected officials that they must work with us to make access to high-quality health care a human right and public good in this state. Better protections for and further investment in workplace safety, family medical leave, reproductive, women’s, transgender, oral, and mental health, and substance abuse treatment services. STAND UP TO JOIN THIS FIGHT!